TRANSMISSION, 6-SPEED AUTOMATIC, HEAV. AUDIO SYSTEM, AM/FM STEREO, Onboard Communications System, ENGINE, VORTEC 6.0L VARIABLE VALVE TI. AIR CONDITIONING, SINGLE-ZONE MANUAL. DIFFERENTIAL, HEAVY-DUTY AUTOMATIC LO. 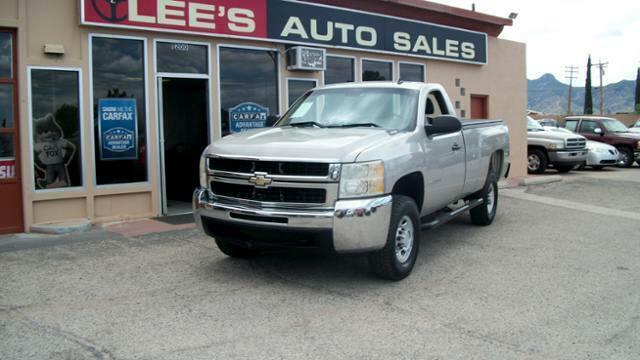 AIR CONDITIONING, SINGLE-ZONE MANUAL FRONT CLIMATE CONTROL (Standard on Extended and Crew Cab models), DIFFERENTIAL, HEAVY-DUTY AUTOMATIC LOCKING REAR, CRUISE CONTROL, ELECTRONIC with set and resume speed, located on steering wheel, AUDIO SYSTEM, AM/FM STEREO with seek-and-scan and digital clock (STD), HEAVY-DUTY, ELECTRONICALLY CONTROLLED with overdrive and tow/haul mode (STD), VORTEC 6.0L VARIABLE VALVE TIMING V8 SFI (353 hp [262.8 kW] @ 5400 rpm, 373 lb-ft of torque [505.6 N-m] @ 4400 rpm) (STD). The new Silverado is designed to continue its reputation among owners as the strongest, most dependable and longest lasting truck on the road. -newCarTestDrive.com.